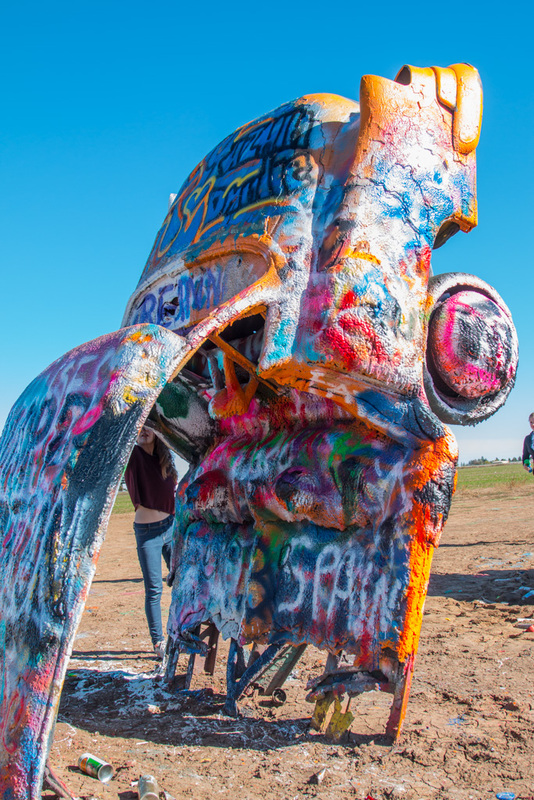 We spent several days in Amarillo, Texas. There is more to do there than we had thought! 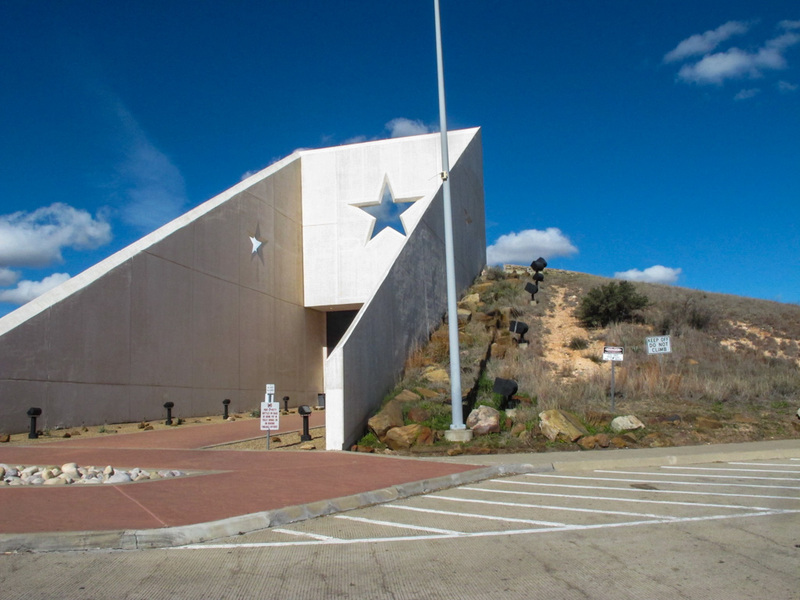 We enjoyed our time in Texas, starting with our stop at the I-40 Welcome Center as we crossed in from Oklahoma. 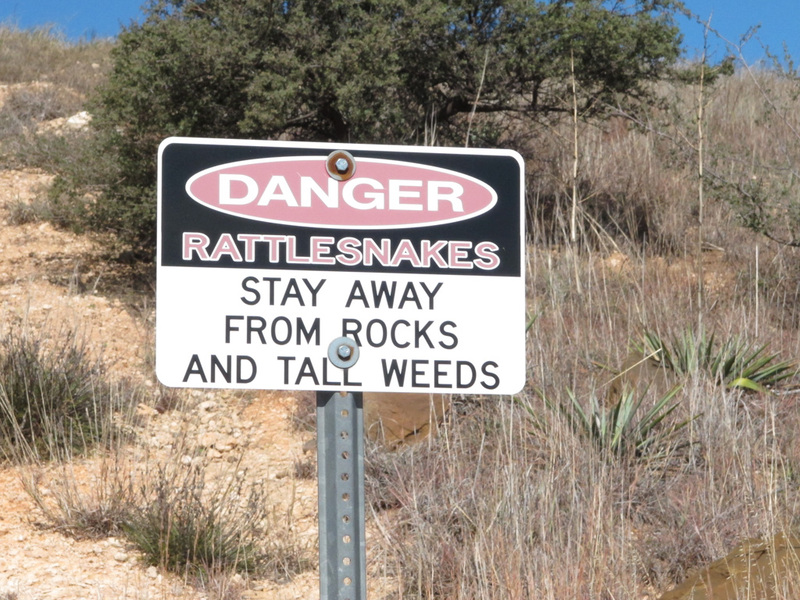 And we had some reminders that we “aren’t in Kansas” (i.e., Maine) anymore! 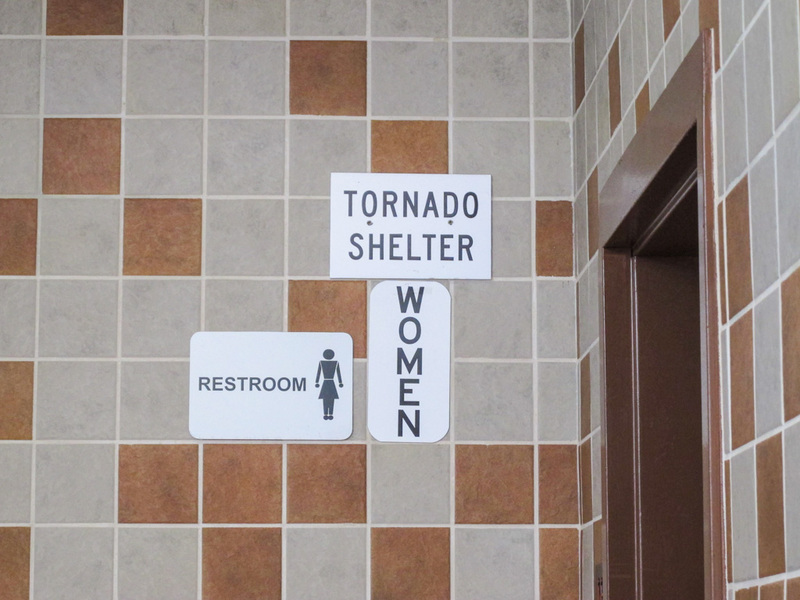 Well… Maybe we ARE in Kansas, Toto! Texas is the state with by far the largest wind power capacity, about 22.6 gigawatts, as of 2017. And they’re still building. There are wind turbine “farms” seemingly everywhere! Go, renewable power! What you can’t see in any picture is that these farms go on for miles. They are beautiful and quite mesmerizing. 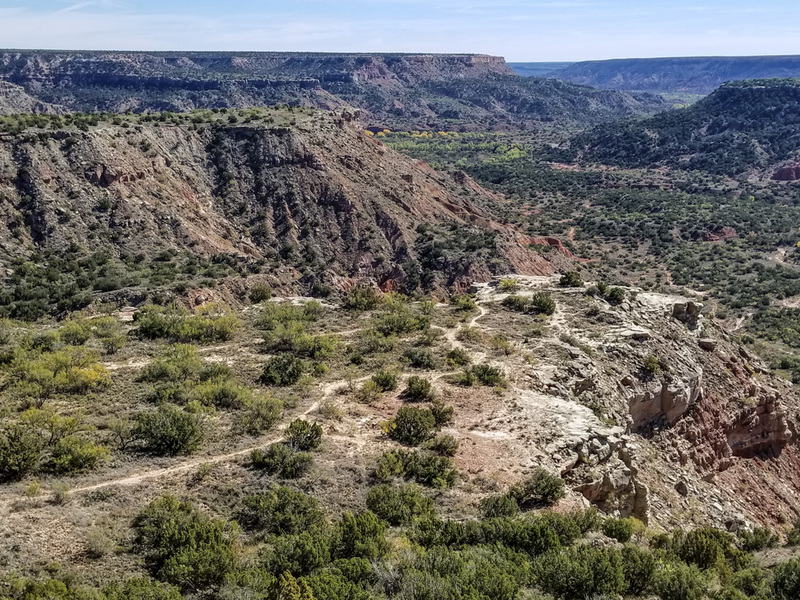 When you’re looking at the Palo Duro Canyon, don’t try to compare it to the Grand Canyon. If you do, you will do yourself a disservice and miss the beauty here. 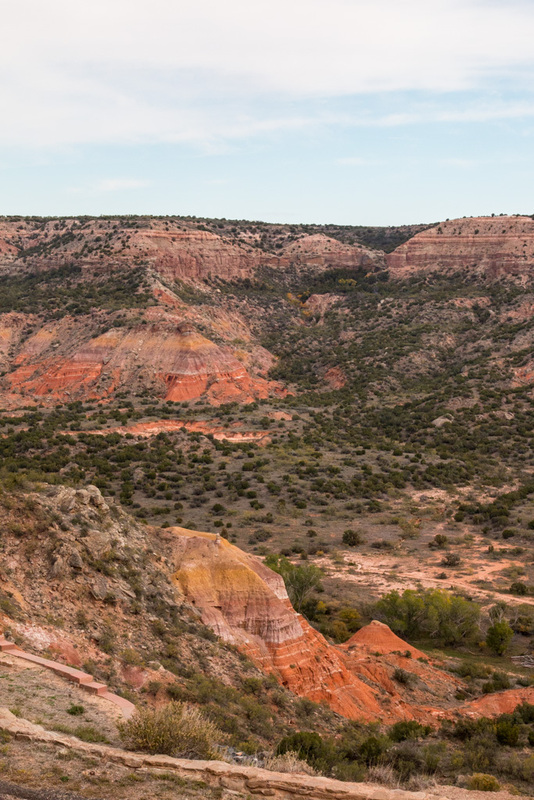 Palo Duro is the second-largest canyon in the country, and has its own beauty to explore. 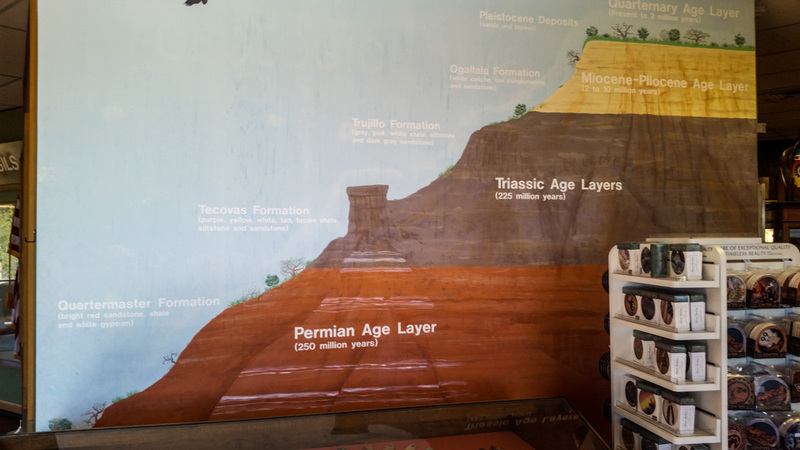 The colors in the layers indicate how old the layer is. The panhandle of Texas was once a seabed, and this stone was laid down across millenia. 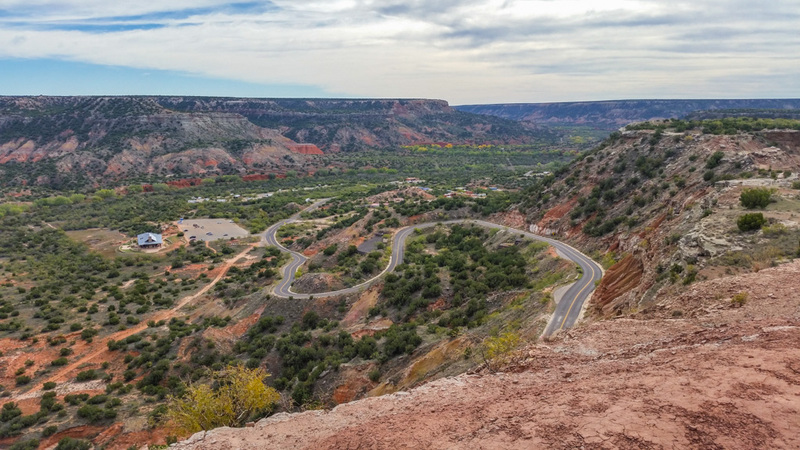 Unlike the Grand Canyon, Palo Duro has a road to the bottom of the canyon. There are campgrounds down there and people bring their large RVs. We went to the bottom, but I’m very glad that we weren’t pulling Rhett! 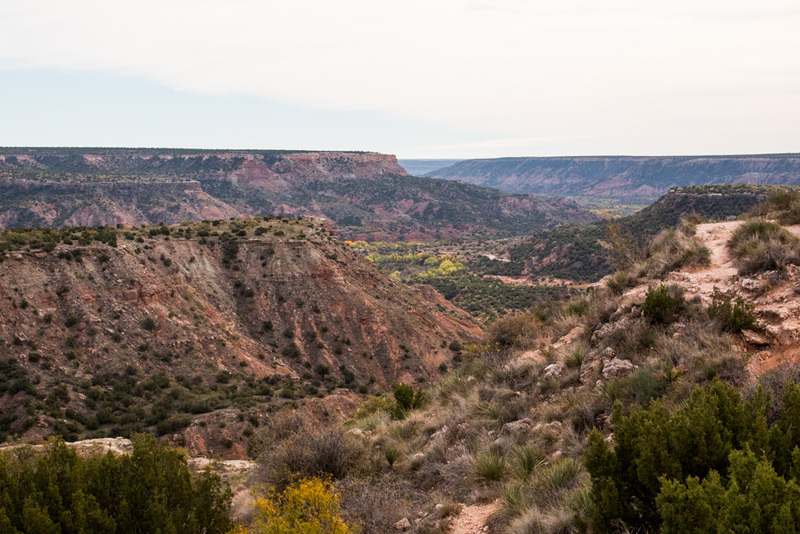 Take a look around the canyon! 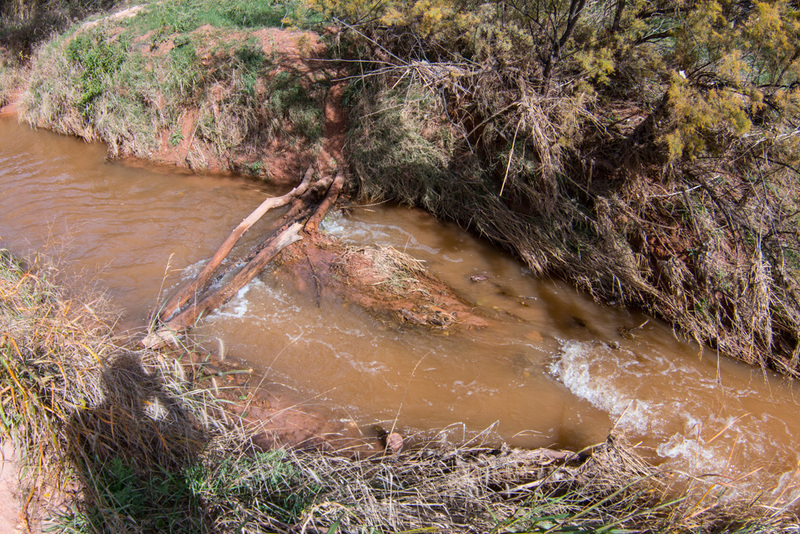 The canyon is still being formed by the action of the river. The day we were there, the river was about 6 feet wide and flowing slowly. However, flash flooding is a big problem. Wherever the road crossed the river there were flood gauges at each end of the bridge, measuring road flooding up to 5 feet above grade. And the bridges were 15 to 20 feet above the river! 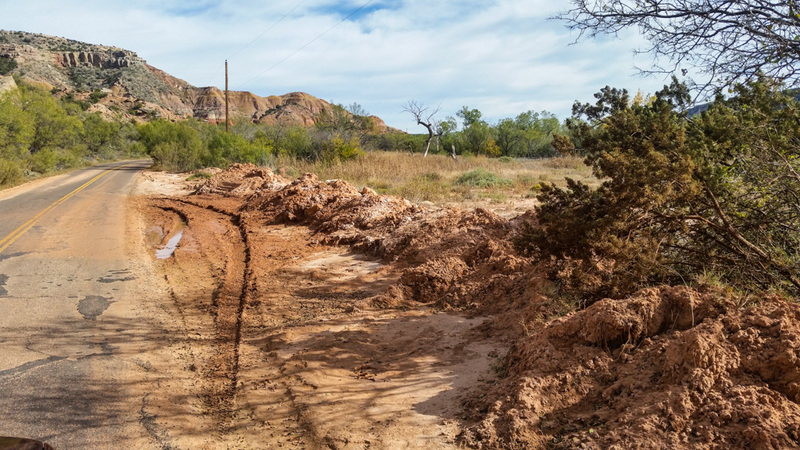 They don’t need to shovel snow here (at least very often), but they have a lot of work clearing the road after a flash flood! 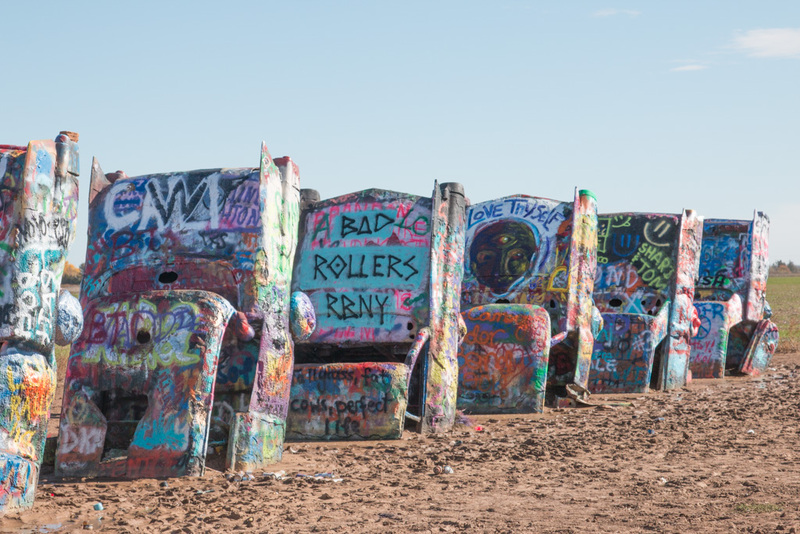 You’ve probably heard about this unusual place, where some artists buried eight Cadillacs nose-down with the backs of the cars sticking up. It was nearby, so… Why not? 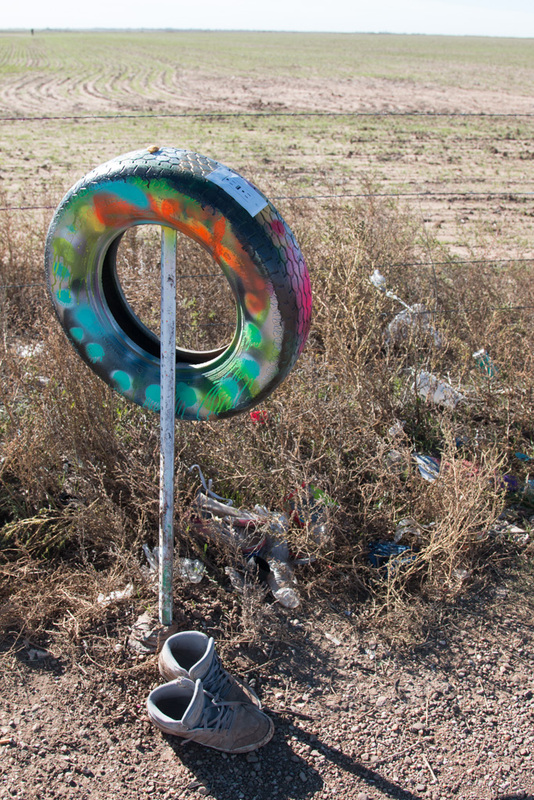 We didn’t realize that it was an ongoing art project, encouraging people to contribute by spray painting the cars! 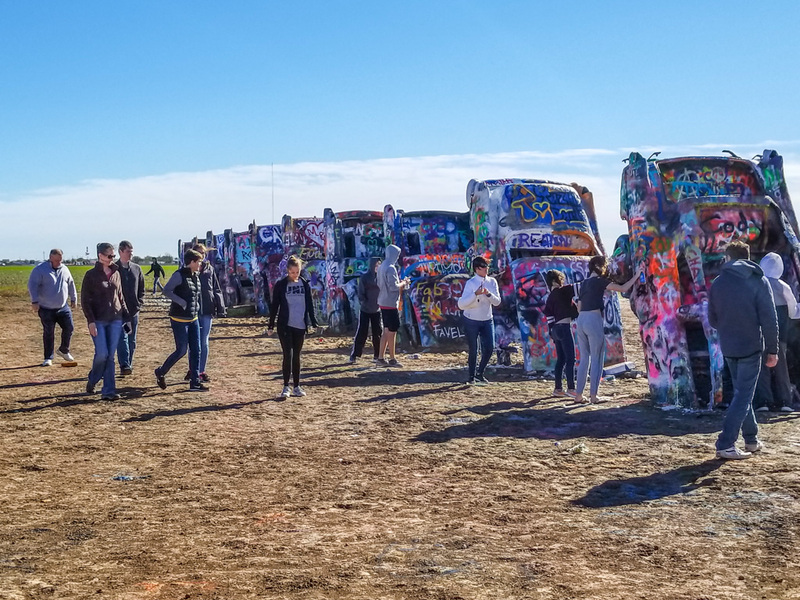 It was fun to see the cumulative effect—wow! Some people sprayed expanding foam as well as paint. 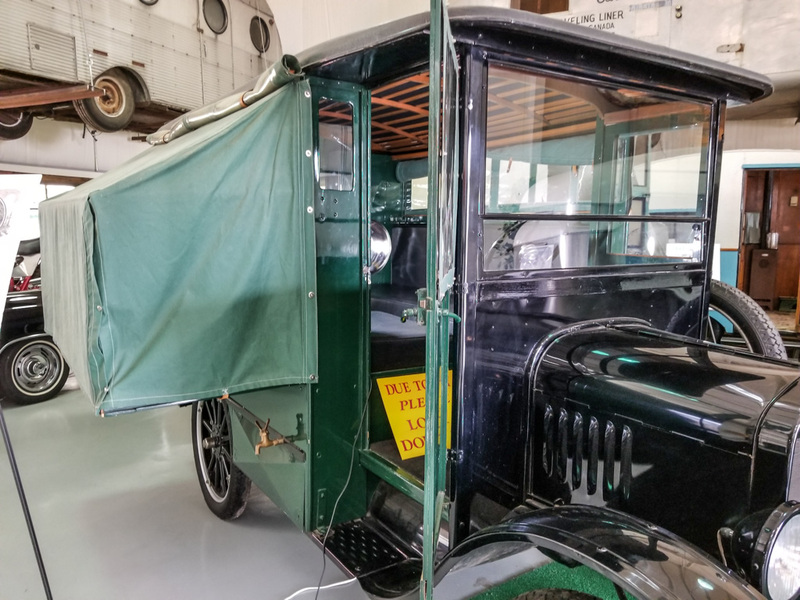 We didn’t know about this one ahead of time… Jack Sisemore, the owner of an RV dealership in town, created an RV museum. It was highly recommended to us by the folks at the next campsite (who happened to be from NH!). I expected a small garage with a few RVs in it. 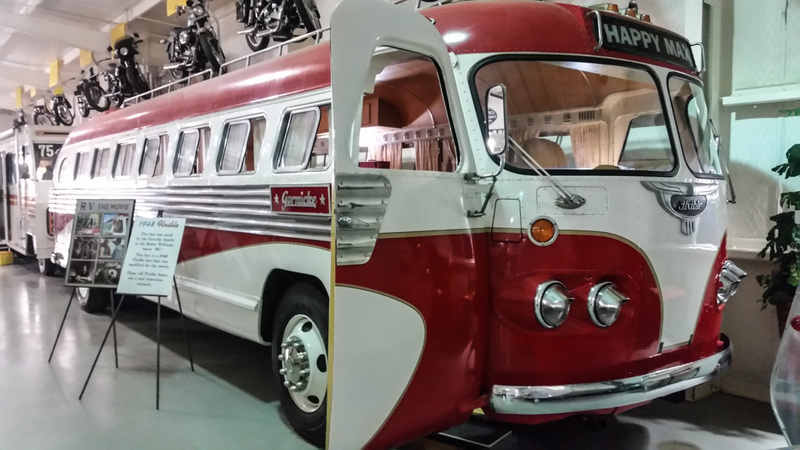 This is a serious museum of the history of RVing, containing many firsts or only remaining examples of units. One of the first tent trailers. We spent many happy vacations in its descendants! The unit from the Robin Williams movie, “RV”. 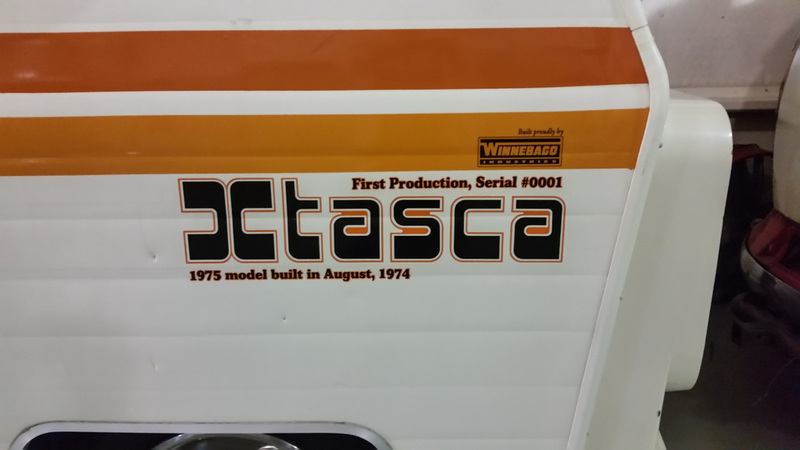 Itasca by WInnebago. Serial number 1. 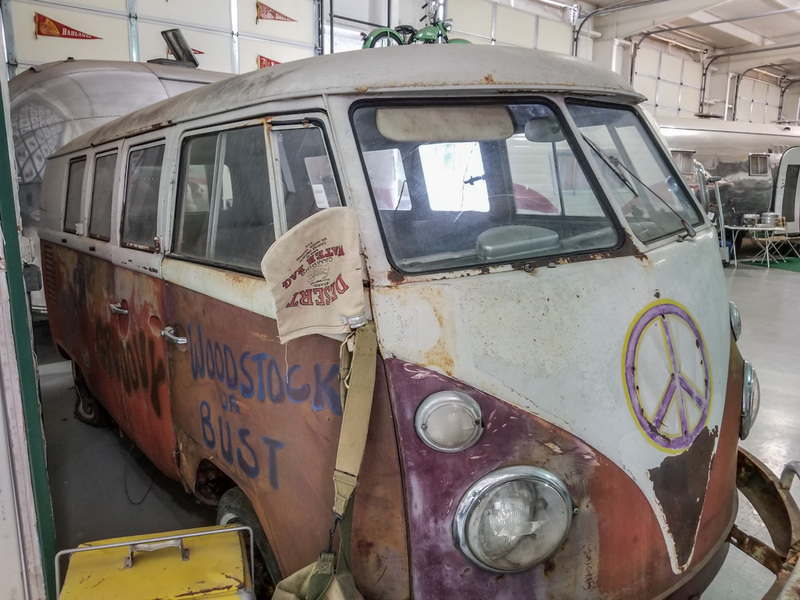 What would an RV museum be without a VW microbus? Al’s family went camping through the Canadian maritime provinces in one of these in the 60’s. I didn’t know until we were in the museum that Jack had started the Keystone company, one of the behemoths in the RV industry, in 1996. 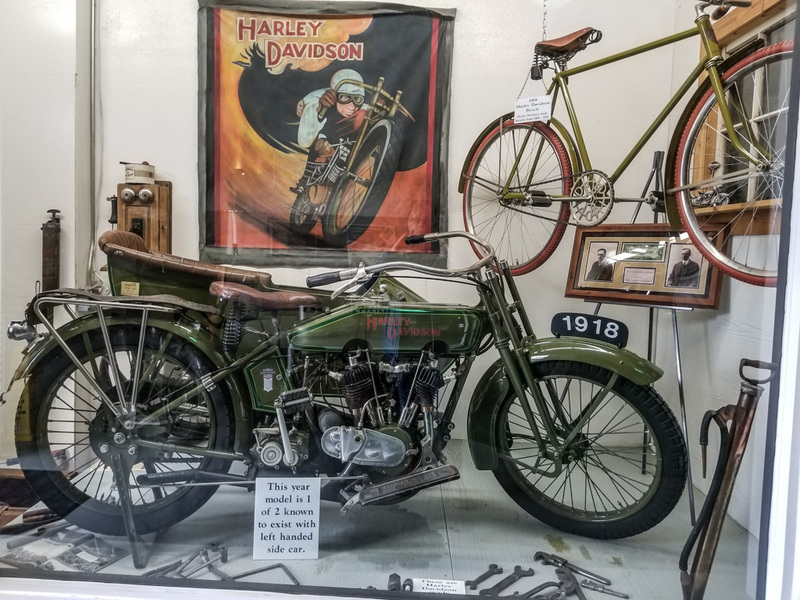 Jack is a motorcycle fan as well, and has many exhibited through the museum. Impressive! Here are two that caught my fancy. 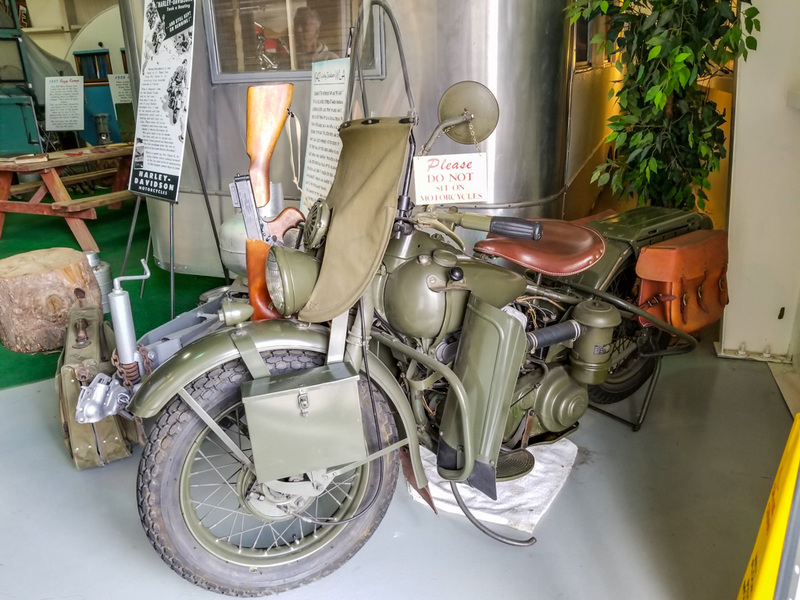 The Harley WLA from WW II. Since most of these were modified for civilian use after the war, very few remain in their wartime configuration. And they mean ALL of it. 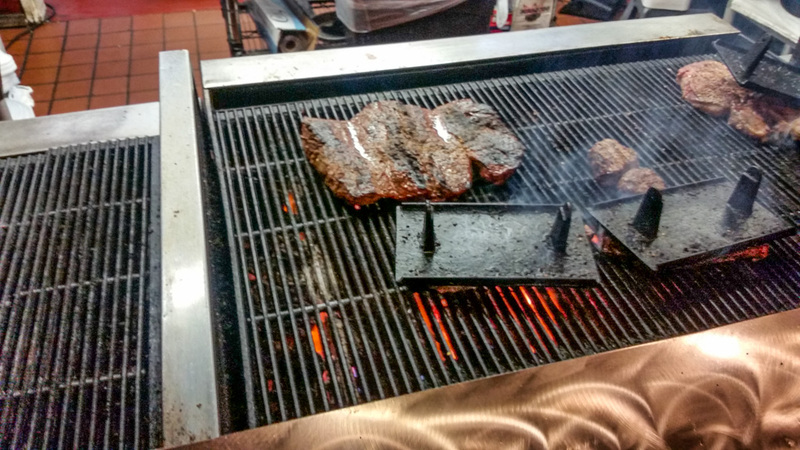 This is what 72 ounces of beef looks like! Yeah. Four and a half pounds. I was told that about 1 in 7 finish in under the time limit. According to our server, you have to pay first, which is returned to the lucky few. And you eat it on a stage, so everyone else can watch your valiant efforts! The fastest time (according to the web) is by a small woman who finished the steak in under 3 minutes! You can find it on You Tube pretty easily, but trust me, you do not want to watch it! It isn’t pretty. Want to try? Neither did either of us. Finally, just want to note that Kathe has driven every single one of our more than 8,000 miles of this adventure! Way to go! Just caught up with reading. 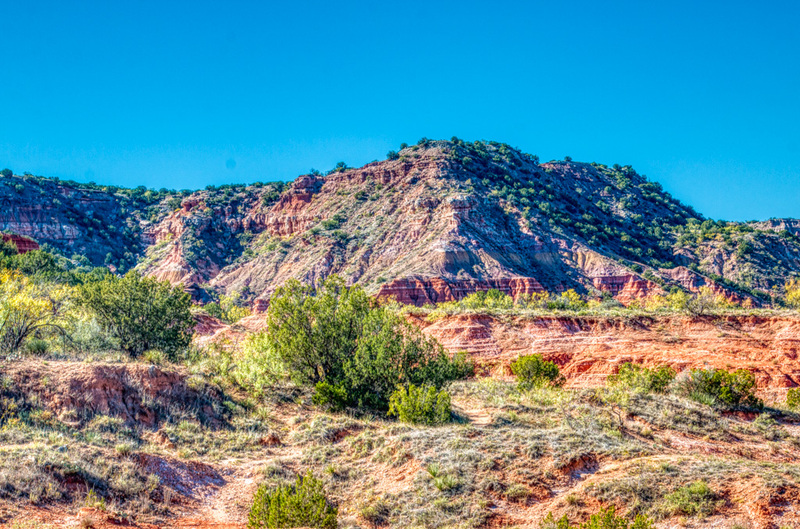 Palo Duro Canyon is gorgeous! 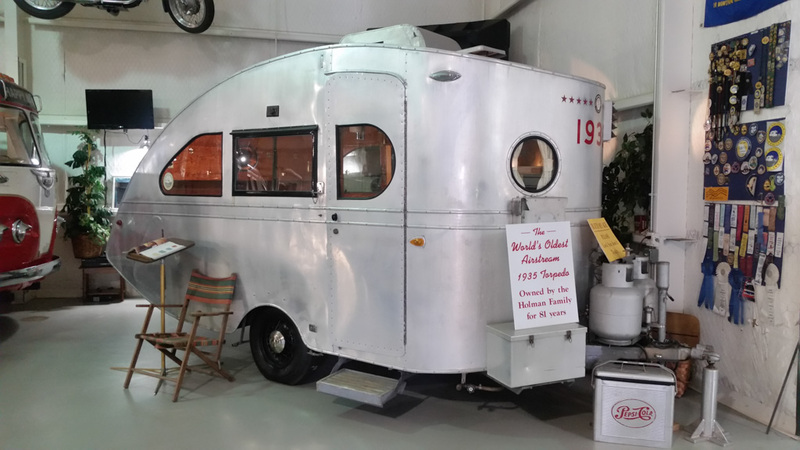 The RV museum looked interesting too – I loved the early Air Stream – looks a little like some of the larger Tear Drop campers. 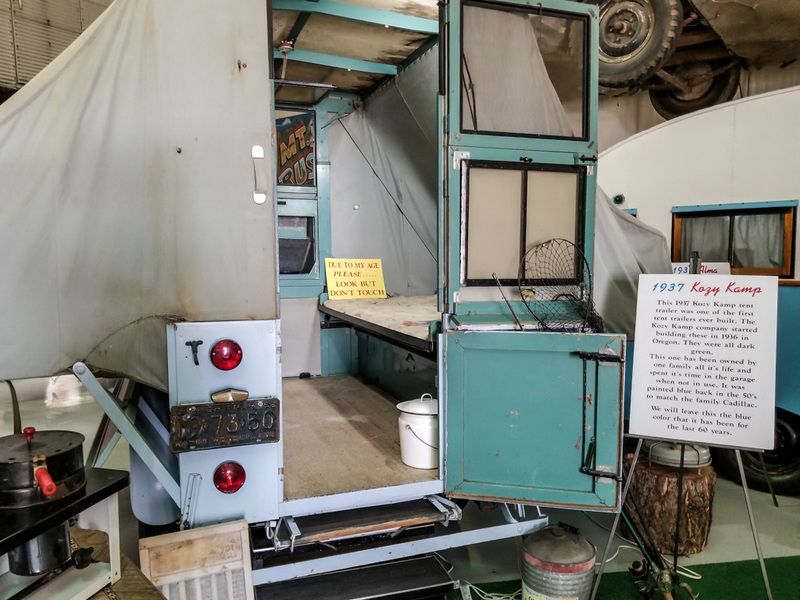 They also had one of the very earliest tear drop campers, from the 1940s. Basically a mattress inside, and a kitchen behind! Not much changed for today’s tear drops, I think. 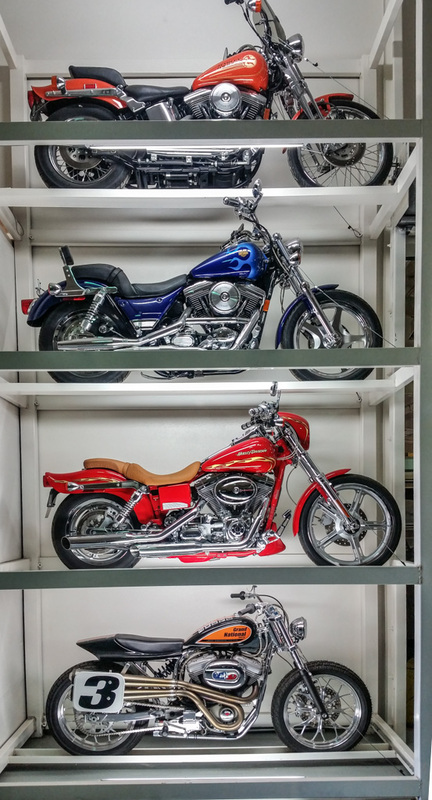 What an fascinating museum! 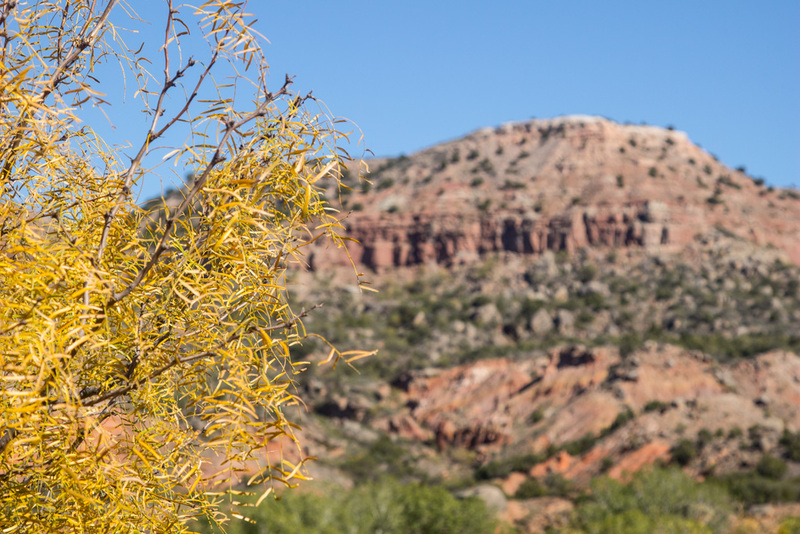 The canyon looks stunning,you have taken some great photos of it. Everything certainly seems bigger in Texas. The two of you are having an amazing journey. I think about your adventures often and love the pictures and updates. 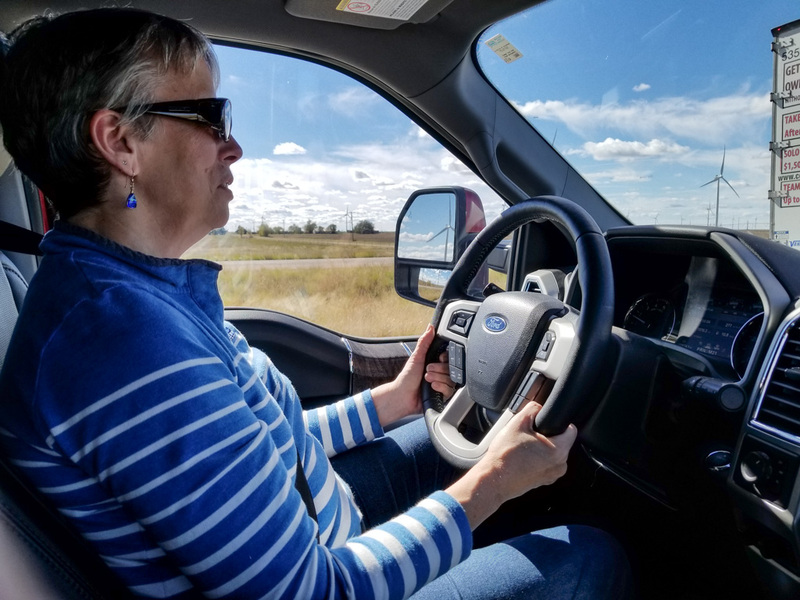 The picture of Kathe, the driver, definitely makes me want to pick her brain on driving tips at some point. I have not been able to muster the courage to drive our rig. 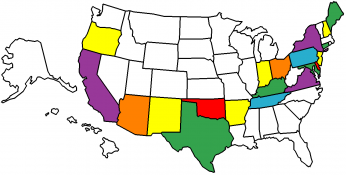 We made our reservations today for the Grand Design Mid Atlantic Rally. Hopefully, we will see you there next year in October. . . Happy Trails! !